For some reason last month, I was in the mood for some french toast. So here is the recipe that I came up with, using a basic recipe off of food network as a starting point, and the final product actually turned out pretty good. Instead of whisking, I used a stick blender to mix up the milk, egg, honey and salt. I then poured the egg mixture into a 11″ x 7″ pyrex dish, and added all four slices of the bread to soak up the egg mixture. It might take a couple of minutes (5 to 10 mins), but the bread will absorb all the egg mixture. 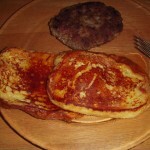 While the bread is soaking in the egg mixture, heat up a frying pan to about medium high heat (#6 on an electric stove.) Then take a stick of butter to lightly butter the pan. 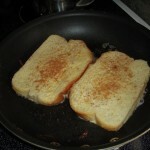 But before you add two slices of soaked bread to the pan, give them a light dusting to cinnamon & sugar on both side. 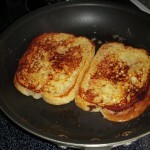 Cook the french toast until browned on both sides. Repeat with the last two slices of bread. Serve immediately with copious amounts of maple syrup. 1) Don’t pour the egg mixture on the bread, you’ll just end up with a hole in one of the slices of bread. 2) Could you use skim milk, probably. I just happened to have some leftover whole milk, so that was what I used.